The programme won the BAFTA for best documentary, a Priz Italia, other international prizes and an Emmy nomination – this proves that mathematics can be as emotional and as gripping as any other subject on the planet. 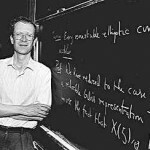 Other pages on this site tell you the tale of Andrew Wiles and Fermat’s Last Theorem, so I won’t rehash the whole story again. However, it is worth pointing out that the story has all the elements of a great Hollywood movie (which you can still watch online at the BBC website (UK only) or at Vimeo). There is a brilliant genius from the past who solves an apparently impossible problem. He dies without revealing the solution. This becomes buried treasure, and every subsequent mathematician goes in search of it. There are heroes, villains, rivals, rich prizes, a duel at dawn, a suicide and an attempted suicide, but after 300 years the problem remains intact. The greatest minds on the planet failed to solve it. Undaunted, however, a young boy promises to devote the rest of his life to solving this notorious problem. After thirty years he suddenly identifies a strategy that might work. For seven years he works in secret. He reveals his proof, only to learn that he has made a mistake. He hides away again, humiliated and ashamed, but he returns a year later, this time triumphant. The problem has been solved. His journey is over. The documentary was about mathematics and mathematicians, but it was also about childhood dreams, ambition, obsession, passion, failure and triumph. Not surprisingly, there was a time when one of the Hollywood studios put in a serious bid to make a feature film, but somewhere along the line the project faded away. The emotion of the documentary is clear from the first minute. 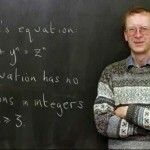 The opening sequence shows Professor Andrew Wiles recalling the moment when he realised that he had solved Fermat’s Last Theorem and achieved his childhood dream. The memory is so moving that he begins to stumble over his words. He then pauses, takes a breath, tries to continue, but eventually he is overcome with emotion and turns away from the camera. There are other moments in the programme that are equally emotional. The programme gets repeated from time to time, but I have no idea how you would find out if and when it is being broadcast but you might be able to find it through a search engine. In the meantime, you can read a transcript here. The documentary was also broadcast and supported by Nova in America, and they have an excellent website based around the programme. After making the documentary, I began working on my book on the same subject. 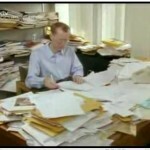 The documentary was great because it allowed mathematicians to speak for themselves, it conveyed why they spend their lives on problems that seem to have no practical use, and it revealed the beauty and passion of mathematics. The aim of the book was to build on this, but also to explain more of the mathematical concepts. Television is not a great medium for explanation, but the written word is. 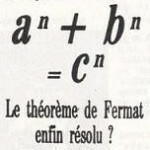 Also, the mathematicians who appeared in the documentary were so compelling that they dominated the programme, and as a result there was no time left to cover the history of Fermat’s Last Theorem. So another objective of the book was to explore the rich history of this infamous problem. Anyway … if you have seen the documentary, I hope you enjoyed it. From my point of view, it was a great privilege to work with all the mathematicians involved and to have a chance to tell this extraordinary story. And if you haven’t seen the programme, then keep an eye out for it whenever you are channel hopping or catch it online here.